Removal of your trash and collection of recycle items becomes a big problem when it is not done in a reliable and timely manner. Removal of heavy trash is a challenge until you know that we will help you. Collection Centers place restrictions on how they want the trash bundled which we must pass on to you, our Customer. Follow the guidelines, posted on this website, for preparing your trash and we will haul it away. Items excluded from normal collection are dirt, mulch, rocks, bricks, concrete, tires, batteries, motor oil, cooking oil, waste generated by a private contractor or any materials or items deemed hazardous materials. Please do not dispose of gasoline, motor oil, paints, cooking oil, or any other liquid items in a container that is not visible to Contractor personnel. If it results in spillage, that causes a stain, Best Trash is not responsible for the clean up. Best Trash will leave a tag explaining the reason for non-collected item(s). Trees, shrubs, brush trimmings and fencing must be bundled and tied into bunches up to 40 pounds, in lengths no greater than 4 feet long, with no branch diameter exceeding 4 inches. The bundling is required to allow quick pickup and size limitations are required to avoid damaging the equipment in the compaction process. Grass clippings/yard waste must be placed in bags or containers not exceeding 40 pounds. Items such as appliances, furniture, carpet (up to 1 room, rolled up and tied, four feet wide and weighing less than 40 pounds), will be picked up either collection day. By Federal Law, refrigerators and freezers or any other items containing Freon must be drained of Freon and have an accompanying bill to validate such service was performed. An enhanced feature of BEST TRASH is special pick up for items excluded by the contract. If notified in advance, Best Trash will meet with you prior to collection day to determine a price to haul away non-contract items. If you do not notify Best Trash of such a special pick-up before your scheduled pick up day, Best Trash will leave a notice for you to contact Best Trash during normal office hours to arrange a price and time for the extra pick up. Best Trash takes great pride in our recycling program and efforts. Ensuring the best recycle program for our customers takes time and effort by both parties. Please remove caps, liquids and food products from the inside of containers. Please only use the recycle carts for recyclable materials, not as an extra trash container. Best Trash will collect all paper products (including cardboard), plastics 1-7, aluminum and tin cans and all glass (clear and colored) that are placed within the provided recycle cart. If items exceed container capacity, please place them adjacent to the cart well marked as recycling materials in containers or bins up to 40 gallons in size. 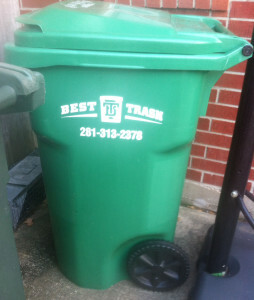 Best Trash will provide each current residence with one recycle cart. Best Trash will replace any carts that are defective or otherwise become unusable due to normal wear and tear. Theft, lost or additional carts can be replaced at $65.00 each by calling Best Trash. Holidays: If your regular collection day falls on a holiday (New Year’s Day, Memorial Day, July 4th – Independence Day, Labor Day, Thanksgiving Day, and Christmas Day), the pick-up will be made on the next regularly scheduled pick-up day (Tuesday or Friday). If your recycling day falls on a holiday it will be picked up the next week on your normal scheduled recycle day (Friday). Below are several links that can be helpful in learning more about water conservation.